Picture the scene: It’s 1997. If you were playing First Person Shooter games on your beige PC and massive CRT monitor, you were playing Quake II, Duke Nukem 3D or DOOM. In all three of the aforementioned games, story took a backseat. Sound design boiled down to deciding how to make the guns shootier, and world design primarily consisted of placing explosive barrels. Fast forward another year; it’s November 1998. The dot-com bubble is expanding nicely, Antz is playing in the cinema, and Cher’s Believe is blasting from your personal CD player. After an excruciating wait, you finally get a copy of Half-Life. You bring it home, install it, and finally boot the game up, ready for some first-person-shooting. But – where’s your gun? Where are the enemies? Welcome to a new chapter in the FPS genre. Storytelling in video games as a whole was nothing new by 1998, but merging the FPS genre with it, and especially in Valve’s signature style, was. This was a game where you experienced everything through the character’s eyes; there were no prompts on screen, no books to read, no menus to navigate, and no cut-scenes. All this without even mentioning the massive strides forward the game made in 3D animation, character profiling, and level design. The first five minutes of the game is a cinematic sequence, taking the player through the sprawling industrial project that is the Black Mesa research facility. While some of it make look dated or pedestrian to our 2018 eyes, in 1998 this was absolutely cutting edge. Having the game’s protagonist Gordon Freeman as a faceless, speechless puppet allowed for the player to project themselves inside the game’s story in a way that had never really been done before. Even after the introduction, the game doesn’t give you guns straight away; you’re left to fend your way through attacking headcrabs using nought but your signature crowbar; the game seeks to teach you how to use weapons and items naturally, a massive leap forward for the time. Taking the player through scientific labs, military installations, and alien worlds, Half-Life boasted a variety of story and setting that few other games could claim to have; the game was absolutely lauded by critics at the time and is still beloved to this day. Half-Life still holds up today, mostly; some of its design paradigms are painfully 90s, everything is blocky and square, and some of the sound effects are laughable. The core gameplay, though, is tight as it ever was and it’s still a joy to play. And what of its legacy? 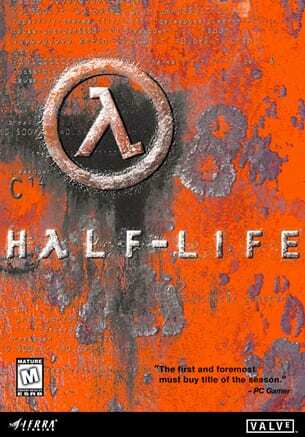 Half-Life spawned many titles we still play to this day; Portal, Team Fortress and Counter-Strike to name but three. Half-life, and its successor, Half-Life 2, released in 2003, are games that first person shooters are still trying to emulate all this time later; that speaks volumes about just what a monumental game this is.